ARIZONA FIREBALL: Over the weekend, midnight sky watchers in Arizona and New Mexico witnessed a "spectacular fireball" that exploded in "a flash like lightning." The brightness may have exceeded that of a full Moon. The approximate time was 0604 UT, a few minutes past midnight MDT on April 26th. A fireball camera operated by Thomas Ashcraft near Santa Fe, NM, captured the event, which was brilliant despite its low elevation: movie. Readers, if you saw or photographed this fireball, please submit a report. "The photo doesn't do it justice," says Fleet. 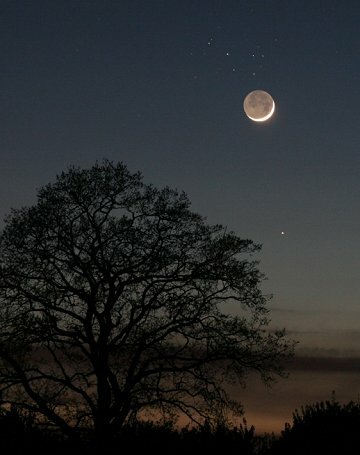 "The binocular view of Earthshine and the Pleiades was very striking." The alignment is now breaking up--Moon exit stage left--but there is still something to see. Mercury and the Pleiades are converging for a mini-conjunction of their own on April 30th. Keep an eye on the sunset: sky map. "On Saturday night, some friends and I decided to go out to take a few pictures," says Serre. 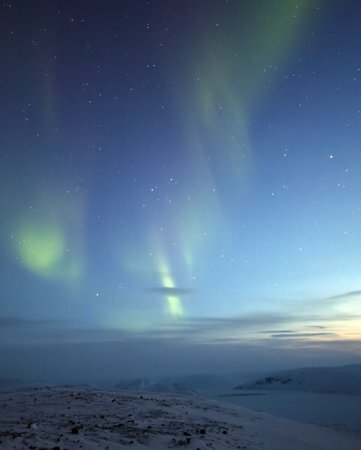 "The sky was not very dark at 11:00 pm, but the Northern Lights came anyway. They were beautiful with a lot of movement over our heads." More auroras are due on or about May 7th when a solar wind stream is due to hit Earth. Northern Lights vs. Midnight Sun--which will prevail? Stay tuned! On April 27, 2009 there were 1053 potentially hazardous asteroids.